Page revised in February 2019. Links to this page can be found in Book 1, Map D2, Day 8 and Rione Borgo. 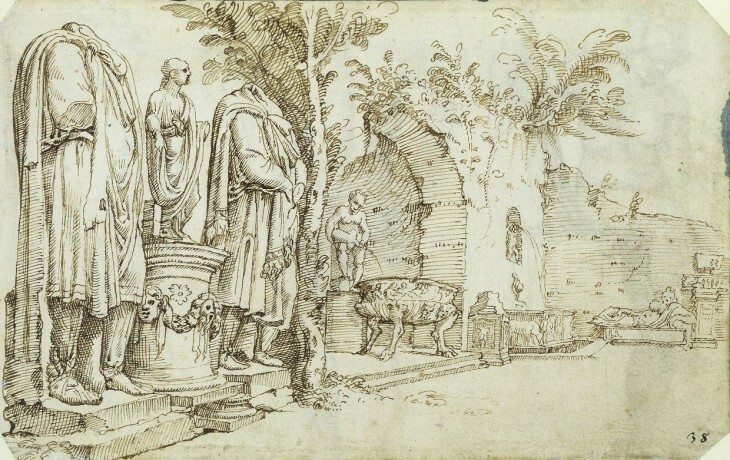 In 1747 Giuseppe Vasi published his first book of etchings depicting the monuments of ancient and modern Rome. 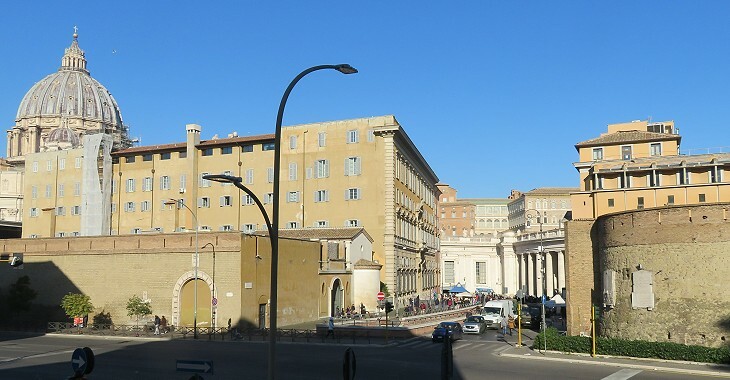 He made his view of Porta Cavalleggeri much more interesting by taking it from a long distance away in order to show the dome of S. Pietro, which is better seen from the hill outside the gate, than from Piazza S. Pietro. Porta Cavalleggeri was aka Porta in Torrione (large tower) owing to two circular towers at its sides; that on the left was pulled down by Pope Pius IV in 1565 when he built new barracks for the papal cavalry. The long building outside the gate was a kiln; the bricks which were made there were carried into the city through Porta Fabrica, a small gate to the left of Porta Cavalleggeri. The view is taken from the green dot in the small 1748 map here below. 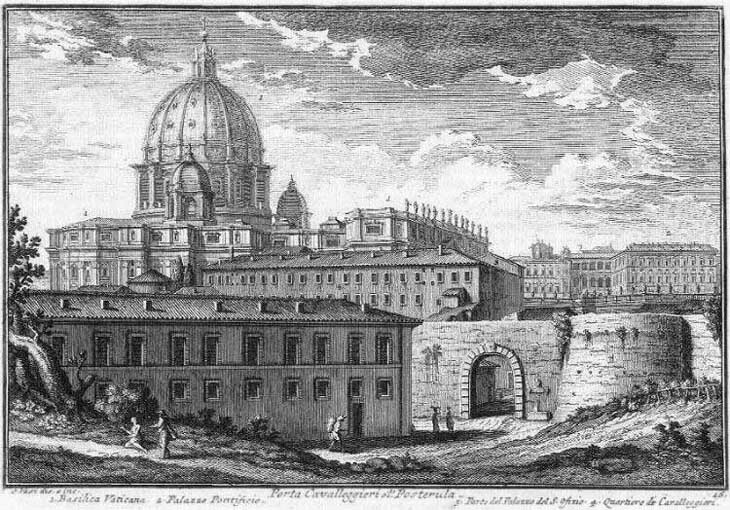 In the description below the plate Vasi made reference to: 1) Basilica Vaticana (S. Pietro); 2) Palazzo Apostolico; 3) Palazzo del Sant'Offizio o della Santa Inquisizione; 4) Quartiere dei Cavalleggeri (cavalry barracks). The map shows also: 5) Porta Cavalleggeri; 6) Palazzo e Giardino Cesi; 7) SS. Michele e Magno; 8) Porta Fabrica. 1), 2) and 8) are shown in other pages. In 1904 a section of the walls which included Porta Cavalleggeri was pulled down in order to open a large street leading to Piazza S. Pietro; the architectural elements of the gate were reassembled to the left of the original location together with a small fountain which stood to the right of the gate. Palazzo del Sant'Offizio was to a large extent rebuilt during the 1920s. The adjoining apse of Chiesa di S. Salvatore in Torrione, shown by Vasi inside the gate, is now in full view. 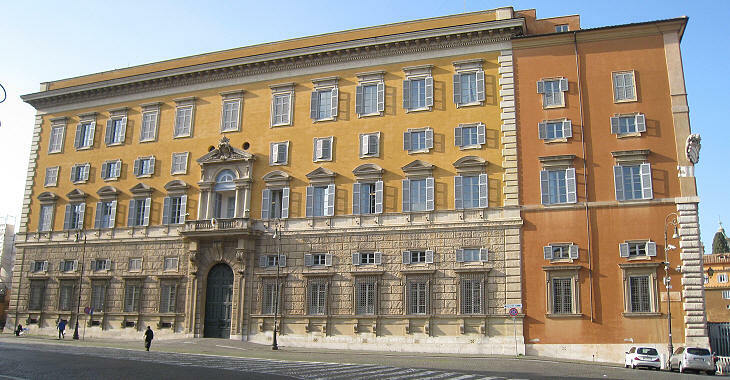 The church and the palace are inside the Vatican City State. The opening of the new street led also to the demolition of Palazzo Cesi. The walls which surround the Vatican were rebuilt by Pope Pius IV, but Porta Cavalleggeri and the two towers which protected it belong to an earlier period; the towers are thought to have been built by Pope Nicholas V, whereas the gate was designed at the time of Pope Alexander VI. 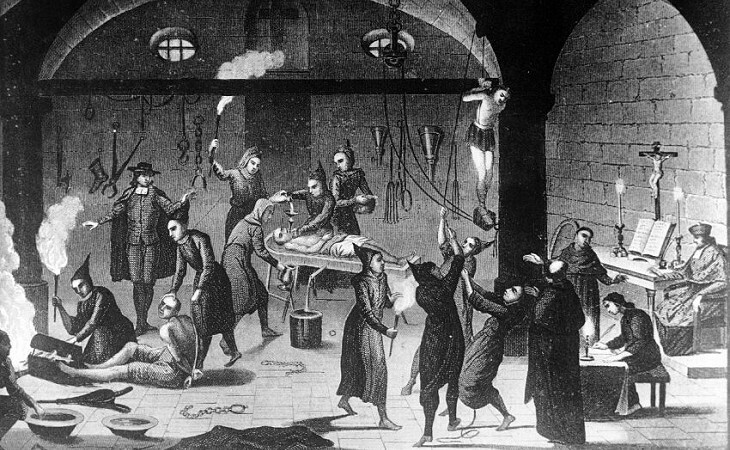 In 1542 Pope Paul III reorganized the Inquisition, the religious body in charge of identifying and condemning heretical views. The official name of the institution, Sant'Offizio della Sacra Inquisizione, notwithstanding its references to holy and sacred, had such a dreadful reputation that in 1965 it was renamed Congregazione per la Dottrina della Fede by Pope John XXIII. The Roman Inquisition acquired a great importance during the pontificate of Pope Pius V who in 1571 bought a series of existing properties and turned them into the premises of this institution; they included a small jail. However some of the most famous trials for which the Roman Inquisition is known, such as those of Giordano Bruno and Galileo Galilei, were held at Convento Domenicano della Minerva. When the holy Mother Church became mistress of the barbarians, she taught them the error of their ways. She put them in this pleasant Inquisition and pointed to the Blessed Redeemer, who was so gentle and so merciful toward all men, and they urged the barbarians to love him; and they did all they could to persuade to love and honour him - first by twisting their thumbs out of joint with a screw; then by nipping their flesh with pincers - red-hot ones, because they are the most comfortable in cold weather; then by skinning them alive a little; and finally by roasting them in public. You may wish to read more of Mark Twain's views on the Inquisition. At the beginning of the XVIth century a property near Porta Cavalleggeri was turned into a small palace by Cardinal Paolo Emilio Cesi. 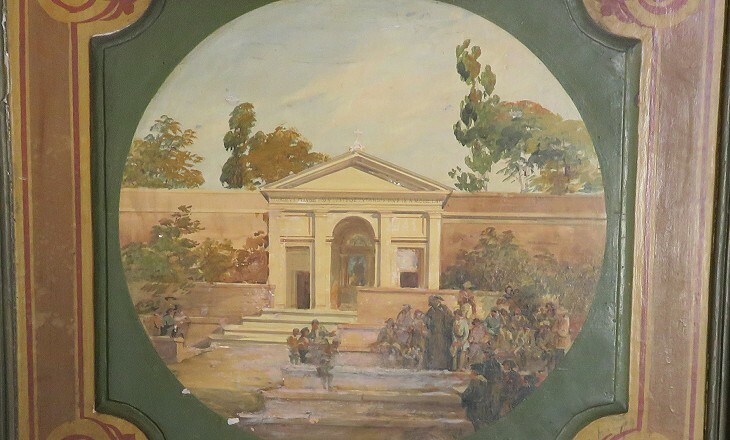 In 1537 it was inherited by his brother Cardinal Federico Cesi who embellished the building and in particular its garden with a fine collection of antiquities. 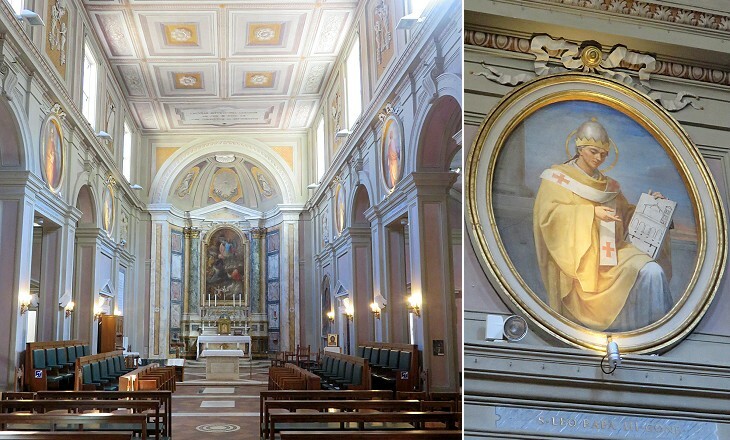 He is known also for having rebuilt S. Caterina dei Funari and having bought and decorated a family chapel at S. Maria della Pace. In 1565 the Cesi bought another palace in Borgo. 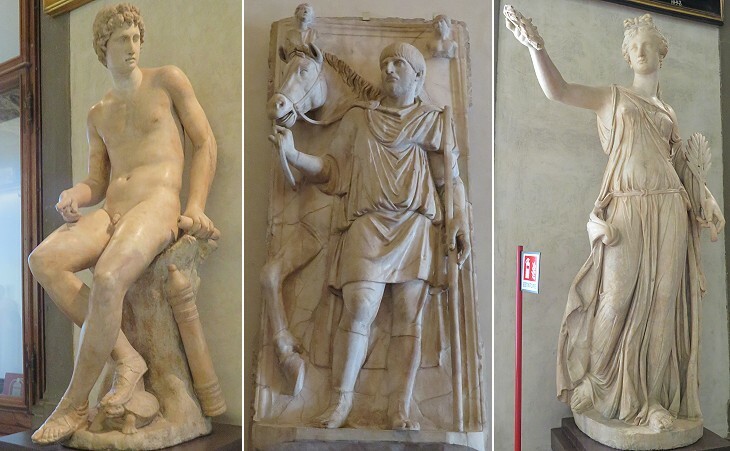 They had also a palace in Ponte and many possessions in Umbria. A 1593 map by Antonio Tempesta indicates the site of the palace which was reduced in size by the construction of Colonnato del Bernini in 1656. In 1904 it was totally demolished. During the VIIIth century the Popes increased their contacts with the kingdoms which were founded in northern Italy and central Europe by Germanic tribes after the fall of the Western Roman Empire, while at the same time they reduced their links with the Byzantine emperors. When between 847 and 853 Pope Leo IV surrounded the Vatican with its first curtain of walls, the area near S. Pietro was almost entirely occupied by four large scholae, (compounds with churches, hostels and hospitals) which were named after the Franks, the Longobards, the Saxons and the Frisians. The Kingdom of Frisia was established in ca 600 on the North Sea continental coastline, from the mouth of the River Rhine to today's Denmark. The Frisian schola was located near that of the Saxons and its church was dedicated to St. Michael the Archangel; at a later date it was dedicated also to St. Magnus, Bishop of Anagni, whose relics were found in the church. This second dedication might have originated from an account which says that the church was founded by Magnus Forteman, a legendary leader of the Frisians. The church was stormed by the Normans in 1084 during the investiture controversy and it was rebuilt in the following century; its bell tower is not visible from the street nor from the small space in front of the façade. SS. Michele e Magno eventually lost its connection with the Frisians and in 1508 it became a parish church. Its current aspect is due to an overall redesign by Carlo Murena which began during the pontificate of Pope Benedict XIV and ended in 1759. Today the church is under the patronage of the Kingdom of the Netherlands, of which Frisia/Friesland is a province. 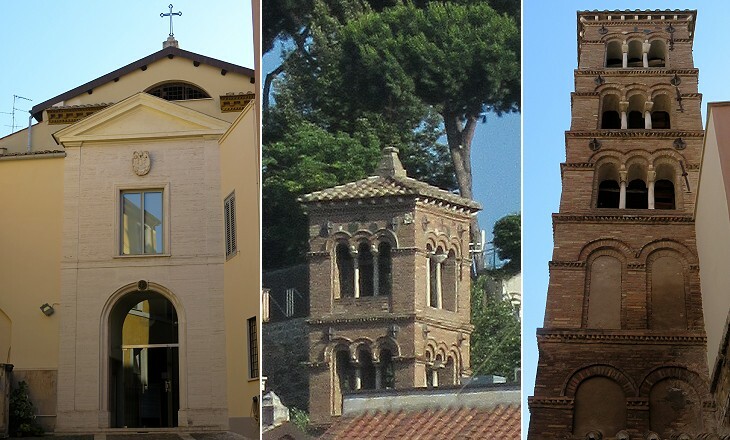 You may wish to see a directory of national churches in Rome. 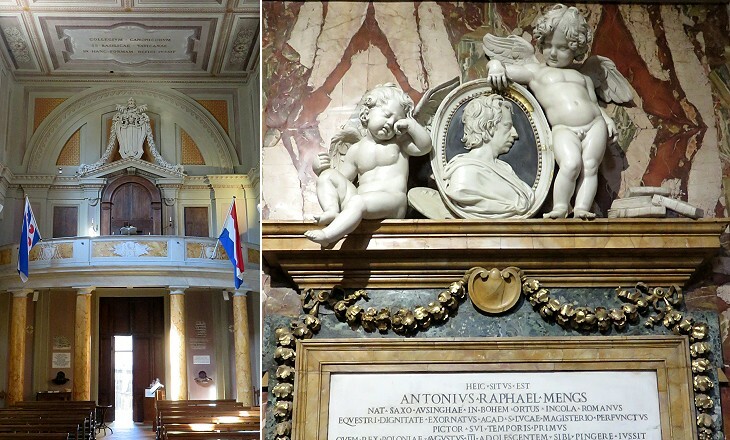 Anton Raphael Mengs (1728-779), a German painter who spent most of his life in Rome is buried in the church. During his lifetime he was regarded as the heir to Raphael; along with sculptor Antonio Canova and art historian Johann Joachim Winckelmann he is considered the father of the Neoclassic style in Rome. In 1771 he was elected Principe dell'Accademia di S. Luca, the guild of the Roman artists. You may wish to see the ceiling he painted at S. Eusebio. 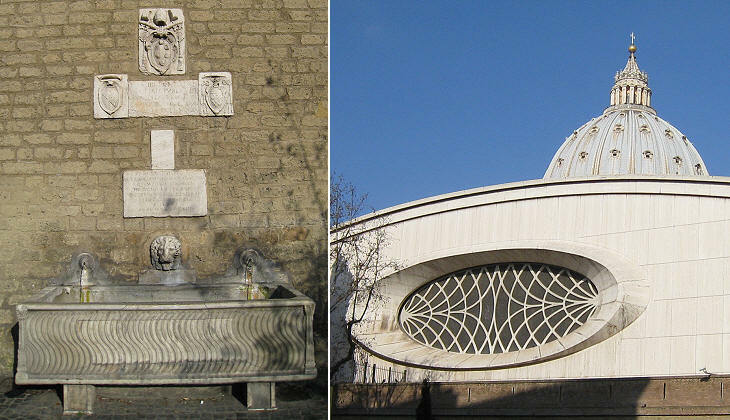 The distance between Porta Cavalleggeri and Porta Fabrica is less than a hundred yards and the only thing worthwhile mentioning is an ancient sarcophagus placed by Pope Pius IV which was used as a trough for the horses of the nearby cavalry barracks. Next plate in Book 1: Porta Fabrica. 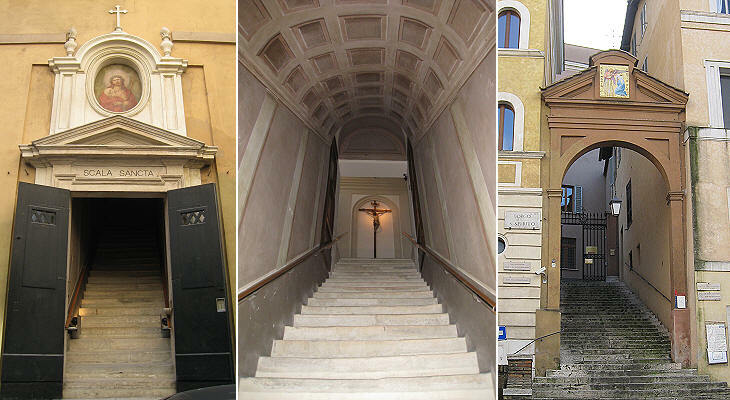 Next step in Day 8 itinerary: Chiesa di S. Maria alle Grazie alle Fornaci. 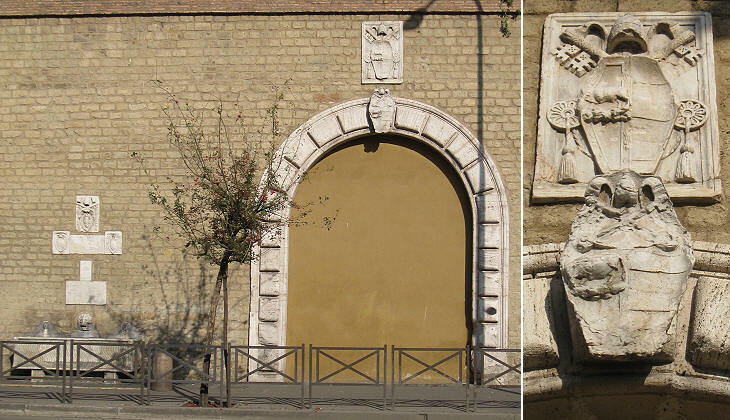 Dicevasi anticamente questa porta del Torrione, dipoi in Posterula; ma essendovi fatto appresso il quartiere della guardia Pontificia, chiamata de' Cavalleggieri, di questi ora porta il nome. Si disse questa chiesa in Sassia, per la medesima ragione, che dicemmo dello Spedale di s. Spirito, mentre le sta non molto lungi. Fu eretta in onore del s. Principe circa l'anno 813. da Carlo Magno sulla punta di quel colle; perciò vi si sale per alcuni gradini, e conservandosi in essa il corpo di s. Magno vescovo e martire, porta il nome ancora di questo Santo. Paolo III. eresse in questa chiesa una Confraternita per associare il ss. Viatico della Basilica Vaticana; e nell'anno 1631. vi fu costituito un collegio di cento Preti, e venti chierici sotto il titolo della ss. Concezione, che poi fu trasportato, come dicemmo, nel collegio Ecclesiastico presso ponte Sisto. Fu ultimamente rinnovata questa chiesa da Benedetto XIV. ed ornata di varie pitture moderne.